At Koi Water Garden, we are able to offer competitive prices on not only high quality koi, but also on koi related goods including test kits and digital test instruments to help keep your Koi's environment in tip top condition. 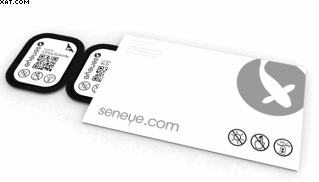 Seneye automatically tests multiple life critical parameters. If you upgrade to the Seneye WiFi pack then the seneye web server with WiFi module removes the need for a pc altogether and allows wireless connection from your seneye device to your router / modem. The data uploads will be automatic which will make them faster and more stable, there are also a few additional alerts such as power (or lost connection) monitoring. 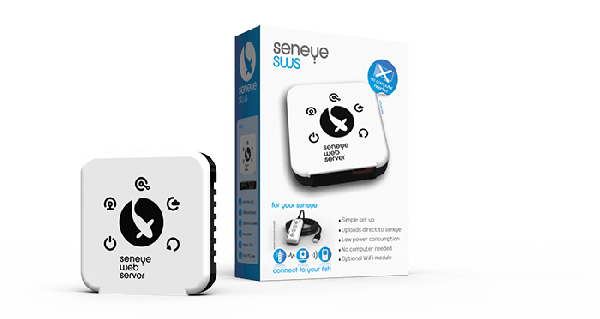 The seneye web server will upload the data from your seneye pond device without the need for a pc. You will then be able to view all your readings from a computer (pc/mac), tablet or smart phone from anywhere in the world via the seneye cloud. 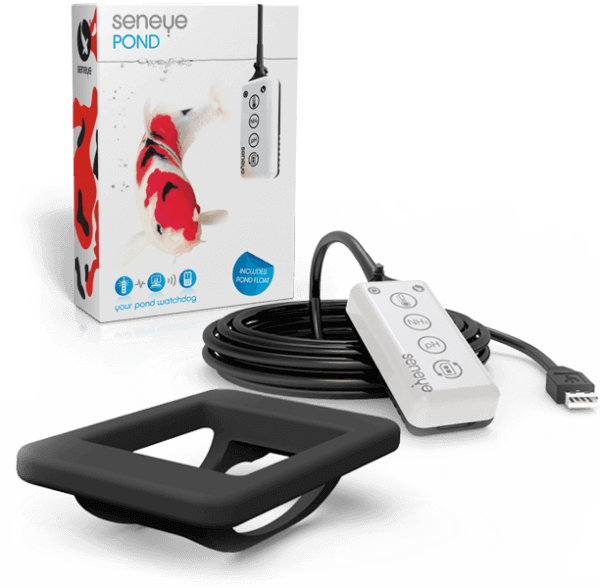 pH monitoring: The seneye monitors pH in your pond water between 6.4 and 9. This range is ideal for most aquatic life and by monitoring this range increased accuracy has be achieved. 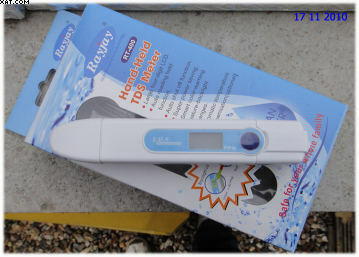 Water level: Water Level readings are only taken when the seneye device is in water, no false readings. The latest technology in digital water testing allows customers to transfer their water testing results straight to an iPhone or Android device using a personalised app. From there they can be stored, emailed and categorised by location or customers. Ideal for customers, who want to test the water in their Pond and: Do a lot of regular testing and want to record the test results Want to keep the results in a chart The iDip® photometer will test your water and download the results for you Results include date, time and location - saving repetitive data entries The new and exciting eXact iDip® photometer harnesses the power of smart devices and the simplicity of design to efficiently handle regular and complex water testing. The smart phone app is designed to work seamlessly with the waterproofed handheld unit with parameter information, data storage and GPS tracking included. Results are quickly available and exact. The eXact iDip® photometer is manufactured using the highest quality standards, capable of running over 35 water quality tests, uses simple AAA batteries. 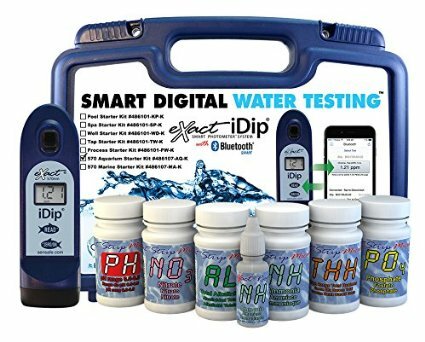 Our iDip® Starter Kit comes with reagents to test water for Ammonia, Nitrite, pH , Nitrate, Total Alkalinity, Total Hardness, Free and Total Chlorine and Phosphate. Further tests can be downloaded instantly within the app. For the full list of tests currently available, please see the list below. Weare also offering the iDip system photomer with no tests, so you can choose your own - see below. New tests are constantly developed - making this a testing device which can grow with your needs and requirements. It also makes it very efficient, as the user only pays for what he actually uses. 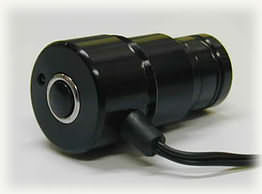 This eXact® iDip® is the first product in the pool water testing market to provide complete wireless connectivity between any Anddroid, iPhone®, iPad®, and iPod Touch® and a photometric device. 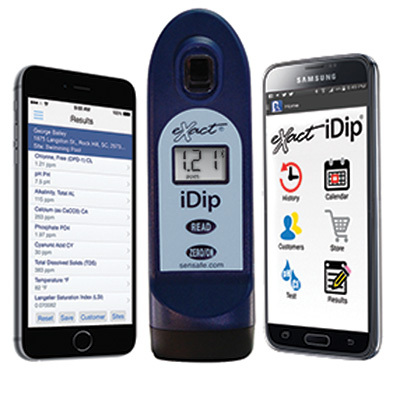 Data is seamlessly transferred between the two devices when paired with the eXact iDip® photometer using Bluetooth® wireless technology that syncs and transmits test results in real time. The application stores the test results history of multiple water sources. Data can be shared via email and the built-in GPS feature allows for easy retrieval of water testing locations. Other parameters available for measurment include:- Salt, Copper, Ozone, Managanese, Hydrogen Peroxide, Chromium and Iron. iDip® photometer uses Bluetooth® wireless technology that syncs and transmits test results in real time. The application stores the test results history of multiple water sources. Data can be shared via email and the built-in GPS feature allows for easy retrieval of water testing locations. Now offered with a 30% price reduction for a limited period only! 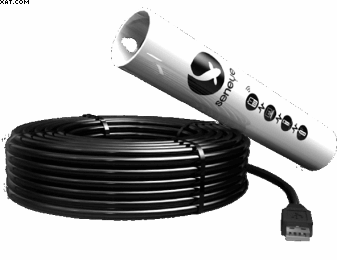 Your round the clock in pond monitor for toxic ammonia. One glance tells you all you need to know - no more regular ammonia testing required! The central disc changes colour as Ammonia increases - once the Ammonia is gone / neutralised, the disc changes colour again within 15 minutes to the 'safe' indicator level. Place the monitor in your pond and the Alerts card continually monitors ammonia levels, registering levels down to 0.05mg/l. Lasts up to a year! Fantastic value! 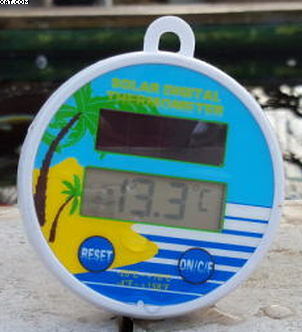 This super floating digital thermometer reads in Centigrade and is really neat. Solar and battery powered. Supplied with tethering cord. This super floating thermometer reads in Centigrade and is accurate - its made specificaly for Koi ponds in Japan - not swimming pools! 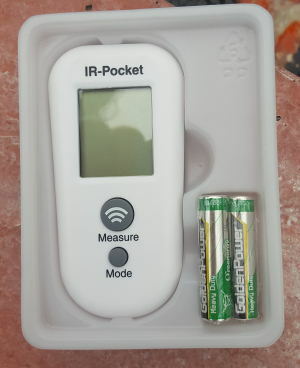 This super little pocket thermometer reads remotely by using Infra Red technology - just point at the water and press the button to get an accurate and instant reading of water temperature. No probe, no wires, no contact with the water. Powered by 2 x AAA batteries, the unit utilises an LCD display which reads from -50 and + 350 deg C, with a resolution of 0.1 deg C - the unit comes complete with batteries. Reads in Celsius or Farenheit. This super little pocket thermometer reads remotely by using Infra Red technology - just point at the water and press the button to get an accurate and instant reading of water temperature. No probe, no wires, no contact with the water. Powered by a lithium battery, the unit utilises an LCD display which reads in Farenheit and Celsius (Range from -10 and 100 deg C), the unit comes complete with key ring and clip so you don't lose it. The Binocular model is recommended for people who require the performance of a professional microscope at a very realistic price. It has a 6volt, 20 watt quartz halogen illumination with rheostat control for optimum illumination. The field lens has integral daylight blue filtration. Like our monocular models, it comes with a mechanical stage and vernier for fine slide adjustment. Specification includes x 10 wide field eyepieces and x 4, x 10, and x100 achromatic objectives with numerical apertures of 0.1,0.25,0.65 and 1.25 respectively. These professional microscopes come complete with carrying case and starter pack of slides. They have a range of 3 magnifications to suit all requirements. The Monocular comes with its own mechanical stage and slide holder to provide the necessary fine adjustment to slide movement and also comes complete with its own aluminium case. Magnification range x 50 - x 800. Also now features inbuilt lamp for specimen illumination. As if that's not enough you also get a fish parasite identification kit thrown in! The identification Kit contains: slides, cover slips, mountants, stains, specimen tubes, gill swabs, skin scrapers, pipettes and step by step instructions. No previous experience of microscope use or slide preparation required. Both units utilise spring loaded front lenses and have both coarse and fine adjustment for optimum focus. We also now offer a mini digital video camera that fits into the viewing eyepiece of any of our microscopes, whether monocular or binocular. The minicam is connected directly to an external USB port of any PC or Laptop operating Windows 98 (second edition) and above - N.B. not suitable for Windows 95 or 3.1. The cameras come complete with software, transformer and USB connection lead. The minicam offers high resolution with an image size of 583 x 438 pixels that is TWAIN compliant and can be imported directly into any image processing software. Watch those nasty little parasites on your PC screen live! This super new microscope has all the features as standard that you would normally only find on much more expensive microscopes. It has objectives x 4, x 10 x 40 and x 100. The eyepiece is x 10 which means this unit can magnify up to 1000 times with the x 10 eyepiece which is enough to clearly identify not only ALL cold water parasites, but many bacteria strains as well. It is also equipped with a mechanical stage with slide clips for fine sample movement. Full sub stage condenser and iris. Inbuilt rheostat controlled sample illumination built in. (Spare bulb included) It also has spring loaded lenses to prevent lens damage on contact with the sample platform. As an option there is a beautiful aluminium carrying case to complete the kit. Also included as standard is a fish disease diagnostic kit (see below for details). Fantastic value for money and we think the best available anywhere in the market at present. 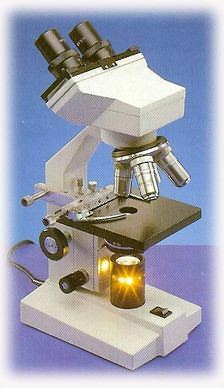 Binocular microscope with inbuilt illumination. Objectives x4,x10,x40 & x100(oil). Eyepieces x10 wide field. Mechanical stage with condenser and iris. A miniature CCTV camera system that links directly to a PC or laptop via a USB port. Software provided. on Mini CD. High resolution version 583 x 438 pixels. Not suitable for use with TV monitors. Simply replaces existing eyepiece. Software enables real time viewing of specimen and still shot capture to record image on your PC. Identification Kit contains: slides, coverslips, mountants, stains, specimen tubes, gill swabs, skin scrapers, pipettes and step by step instructions. No previous experience of microscope use or slide preparation required. At last, we are able to offer our customers a truly professional water testing system. The Palintest portable photometer system is a sophisticated and very accurate device which enables the koi keeper to precisely monitor the condition of the pond water. 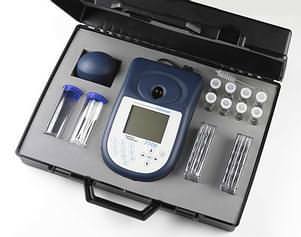 The instrument uses digital colourimetry, long recognised as the most accurate method of determining the levels of many common and some not so common substances that may be present in pond or fresh water supplies. Digital colourimetry is the method used by water companies up and down the country to accurately monitor water conditions and this technology has now been incorporated into a range of portable instruments. 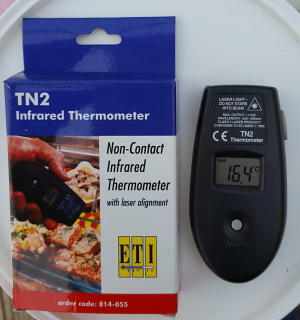 But not only is this instrument extremely accurate, as it utilises a number of different light wavelengths , it can monitor up to 37 different water parameters, including aluminium, copper, zinc, phenols, chlorine, Chloramine, and phosphate as well as the basic necessities of ammonia, nitrite and pH. 37 different tests performed by one instrument, and it does not matter if your pond water is cloudy, green or contains medications, since the instrument calibrates every test sample against your pond water first. No more visual interpretation of colour - no possibility for errors. The new 7100 photometer now automatically selects the correct wavelength and displays the results in mg/l directly on the large LCD display. To demonstrate the accuracy of this unit, it can measure ammonia levels in water down to 0.01 mg/litre, and it will register the presence of this and many other pollutants whilst a normal test kit tells you the water is safe. 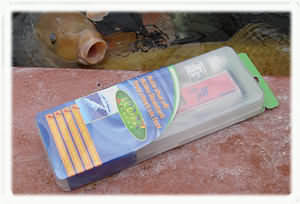 Without doubt the most accurate and flexible water testing system available to the koi keeper anywhere! A bold claim - but one which is easy to demonstrate. We all invest considerable sums in our koi, and we all know that the most important single factor in keeping our koi healthy is water quality. Now for the first time, koi keepers everywhere can accurately and precisely monitor virtually all of the important water parameters which really matter. This instrument could be the best investment in the koi hobby you could ever make. Test your tap water, we know you won't be surprised at what you find - but, test the output from your cartridge water purifier - we think you might be surprised at what you find - whatever the claims! Operating wavelengths 450nm, 500nm, 550nm, 575nm, 600nm and 650nm. 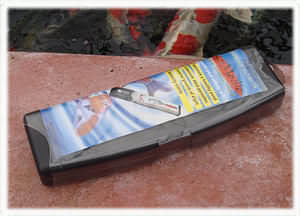 Power 3 x 1.5v AA Batteries (included). Automatic power off. This super combination hand held tester is effectively three instruments in one. 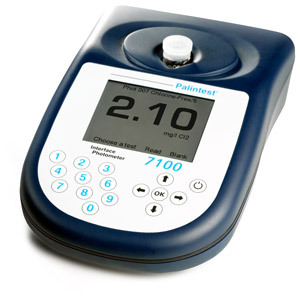 Provides accurate temperature, pH and ORP measurements all at the press of a button. Supplied with temperature probe, ORP Probe, pH probe and pH calibration fluid in a soft carrying case and a hard transport case. Batteries and full instructions included. pH calibration facility. Brilliant value for money. Ensure the accurate measurement of pH with this accurate and simple to use pocket pH meter. Complete with calibration standard. Ensure the accurate measurement of total dissolved solids in the water with this accurate and simple to use pocket tds meter. Ensure the accuracy of each dosage of medication - too little will be ineffective, too much could damage your koi and filtration systems. Range 0-200gm, resolution 0.1 gm. Very compact size with Tare, and calibration feature. Flip off lid to protect the balance when not in use, this also acts as an additional and larger weighing platform. This super multi parameter test kit from the Columbo range includes tests for Ammonia, Nitrite, Nitrate, pH, KH (carbonate Hardness) GH (General Hardness) and Phosphate. Refills are availbale for all tests. Kit supplied in a hard carry case for safe transport and is complete with sample tubes, reagents and full instructions.